Here we are providing free Sap Tutorial. Lets start your Training / Skill improvement on SAP now. Wish you a prosperous and successful career. SAP stands for “System, Applications and Products in Data Processing”. It is the largest business software company in the world and also the largest Enterprise Resource Planning (ERP Software) solution software provider. 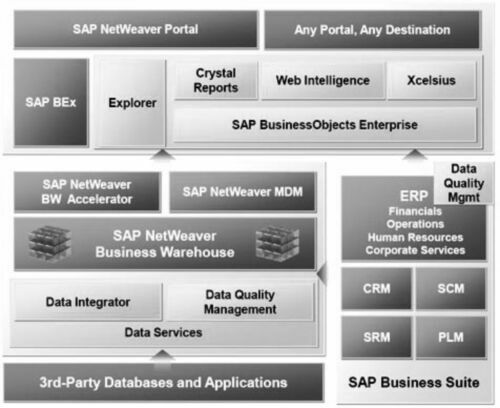 SAP’s main products are SAP ERP (formerly known as SAP R/3) and SAP Business Objects software. SAP software has three-tier application architecture: database, application server and client SAPgui (presentation layer).As per the reports there are over 100,600 SAP installations at more than 41,200 companies in more than 120 countries.R/3 architecture was replaced with the introduction of ERP Central Component (ECC ). SAP’s Business Suite contains five enterprise applications. ABAP stands for Advanced Business Application Programming and it’s a high level programming language used in SAP for the development and other customization processes. Normally a transaction code is used for executing an ABAP program. For example we can use the transaction code VA01 for creating a sales order. Now follow the tutorial link to learn more about ABAP programming, syntax and various tools like LSMW,Bdc, Smartforms, Sapscripts etc. In the first section we have already read about various functional modules in SAP.A single person don’t need to learn about all the modules. Its depends on his role and experience. Now follow the links to learn more about each module. Don’t forget refer interview questions and certification details in this website before your certification exam or interview.Hope our free Sap tutorials in this website is really helpful for you. Also visit their official website and help portal for getting more details about the company and product documentations.